Donald A. Stroh, Assistant Commanding General 9th Infantry Division between August 1941 and July 1944. Donald Stroh was born in Harrisburg, Pennsylvania on November 3, 1892, the son of Harry Lincoln Stroh and Annie Armpriester Stroh. The family moved to Washington, DC in 1896 where Mr. Stroh was employed as a pressman for the Bureau of Engraving and Printing. Donald attended DC public schools. While a member of the Cadet Battalion at Central High School, he developed a life-long interest in military history. After high school graduation in 1911, Donald attended Michigan Agricultural College, later Michigan State University. He was a member of the Cadet Corps for all four years, majoring in Horticulture. After graduation in 1915, he took a job with Sunkist Company in New York City while maintaining his affiliation with the Army through summer training under the Plattsburg program. With the United States entry into World War I, Stroh applied for and was granted a regular Army Cavalry commission effective June 1917. Prior to receiving his Army commission, Stroh accepted a commission in the Marine Corps. He trained as a Marine second lieutenant at Parris Island, South Carolina and Quantico, Virginia from June until August when he was able to effect transfer to the Army. His first Army assignment was the Army Service School at Ft. Leavenworth, Kansas training as part of the Third Provisional Battalion. In October, he joined the 17th Cavalry in Douglas, Arizona as a troop commander. Much to his disappointment, the 17th maintained border defense for the duration of the war, missing the action in Europe. Donald Stroh and Imogene Finger of Hickory, North Carolina were married in June 1917, days before he reported to Parris Island for duty. Their first child, Imogene, was born in January 1918 in Douglas. After the war, the 17th Cavalry was transferred to Schofield Barracks, Hawaii. In 1920, Capt. Stroh accepted a transfer to the Infantry and joined the 35th Infantry as a company commander. While in Hawaii, the Strohs had another child, Harry, in August 1920. Returning to the United States in September 1922, Capt. Stroh attended the Infantry School at Fort Benning, Georgia, and was subsequently assigned to the reserve 85th Infantry Division in Detroit, Michigan. The Strohs spent five years in Detroit, from June 1923 to May 1928. Capt. Stroh served as the executive officer of the 339th Infantry, and adjutant and assistant chief of staff, G-1, of the 85th Division. After attending the advanced infantry course at Ft. Benning, Captain Stroh was assigned to the 16th Brigade at Ft. Hunt, Virginia where he served as the adjutant and S-3. During an annual leave, he and Mrs. Stroh retraced the steps of her father’s Civil War regiment through Virginia and North Carolina. Capt. Stroh then wrote and published the history of the 42nd North Carolina Infantry. From 1931 to 1933, he attended the Command and General Staff College at Ft. Leavenworth. The Strohs shipped out for the Philippine Islands in August 1933 where Captain Stroh served as a company commander with the 45th Infantry at Ft. McKinley. He was promoted to major in November 1934 and then served as the executive officer of the 23rd Brigade. Returning to the United States in January 1936, the Strohs moved to Plattsburg Barracks, New York where Maj. Stroh commanded a battalion in the 26th Infantry. In June 1936, the Strohs returned to Washington where Maj. Stroh attended the Army War College. Following graduation in June 1937, he was assigned as an instructor at the Infantry School at Ft. Benning. In the summer of 1938 he became the Chairman of the Attack Committee at the School, a position he would hold for two years during the critical pre-war years of Army tactics development. In June 1939, young Imogene Stroh married an infantry officer stationed at Jefferson Barracks, Missouri. In July, Harry Stroh entered the United States Military Academy at West Point. In June 1940, Lieutenant Colonel Stroh was assigned to the Presidio in San Francisco where he served as the aide and assistant chief of staff, G-2, to the Commanding General, Fourth Army. In April 1941, he and three other officers were sent to the United Kingdom to study the British military intelligence system. Upon return, he was promoted to full colonel. In the spring of 1942, Col. Stroh returned to the 85th Division as part of the regular cadre for its wartime activation. He commanded the 339th Infantry Regiment upon its activation until his promotion to Brigadier General in July and reassignment as the assistant commanding general of the 9th Infantry Division at Fort Bragg, North Carolina. Mrs. Stroh and Imogene moved back to Washington in 1942 for the duration. The 9th Division shipped out for the invasion of North Africa in October 1942. BG Stroh was responsible for the tactical training and proficiency of the Division. During battle, he assisted the commanding general in tactical matters. In the Battle for Bizerte, Tunisia, he took command of and reorganized the badly shaken 39th Infantry Regiment while a replacement commanding officer was called up. In July 1943, the 9th Division was part of the invasion of Sicily. BG Stroh was awarded the Legion of Merit for his combat roles in North Africa and Sicily. In November 1943, the 9th Division sailed from Sicily for England where it trained for the invasion of Northern France. 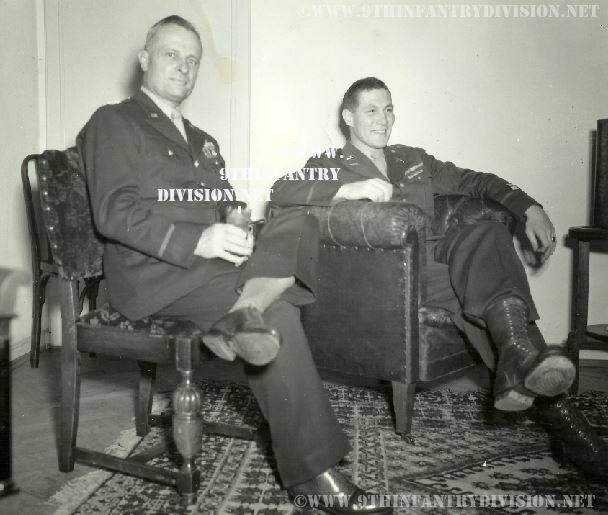 While there, BG Stroh was able to spend some time with Lt. Harry Stroh, a fighter pilot in the Army Air Corps with the Ninth Air Force. Also on hand was General Stroh’s son-in-law, a battalion commander in the 39th Infantry of the 9th Infantry Division. Robert Stumpf and his Father-in-law Major General Donald A. Stroh at the 8th ID command post on November 3rd, the 52nd birthday of Major General Stroh. The 9th Infantry Division landed at Utah Beach on June 10, 1944 and immediately went into battle. The Division cut the Contentin Peninsula and played a key role in the battle for the strategic port of Cherbourg. General Stroh received his second Legion of Merit for this action. On July 4, the 8th Infantry Division landed in France and joined the battle. After a week of fighting, it had made little headway and had taken heavy casualties. Most of the senior leadership were killed, wounded, or relieved. General Stroh assumed command of the 8th Division on July 13th. After reorganization, the division saw heavy action across Northern France. In August and September it was instrumental in the capture of the port of Brest and the clearing of the Crozon Peninsula. General Stroh was promoted to major general in August and was awarded the Distinguished Service Medal and Bronze Star. During the Brest campaign, Capt. Harry Stroh was killed in action while providing close air support for the 8th Division. General Stroh’s 8th Division moved to Luxemburg in September and held a relatively quiet section of the front until November. It then moved into the Hurtgen Forest where it relieved two other divisions and, after a series of bloody assaults, finally captured the town of Hurtgen on November 28th. General Stroh had requested and was then granted a leave of absence to return home to his bereaved family after two years in theater. Two months later, he returned to the front. In the battle of the Bulge in December 1944, the 106th Infantry Division had been overrun by the initial German onslaught. Two of its three infantry regiments had been completely annihilated. General Stroh assumed command of the 106th Division on February 7, 1945 with the task of rebuilding the unit for combat. Throughout February and early March, the 106th Division held the right flank of the First Army, breaching the Siegfried Line against the German 26th Division. After a refitting period in France in April, the division returned to Germany principally for the guarding and administration of vast numbers of German POWs. It continued occupation duties until return to the United States and deactivation in September 1945. General Stroh was then assigned as the Commanding General of the Replacement Depot at Camp Pickett, Virginia. In April 1947, he was assigned to the Army Personnel Records Board. He was medically retired at the end of 1947, then immediately recalled to active duty as president of the records board. 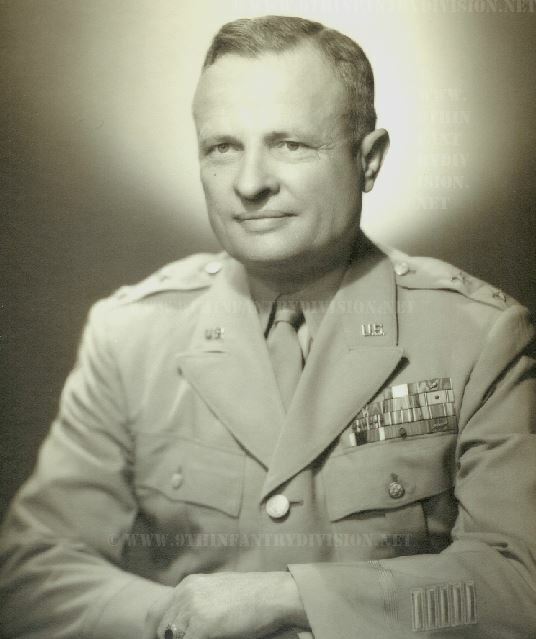 At the conclusion of the records board functions in July 1949, General Stroh retired for good. General and Mrs. Stroh maintained a residence in Washington and also a cottage on the Eastern Shore of Maryland which they named “Crozon.” In 1950, Michigan State University conferred on General Stroh an honorary doctor of laws degree. General Stroh died of complications from his wartime disabilities in 1953. 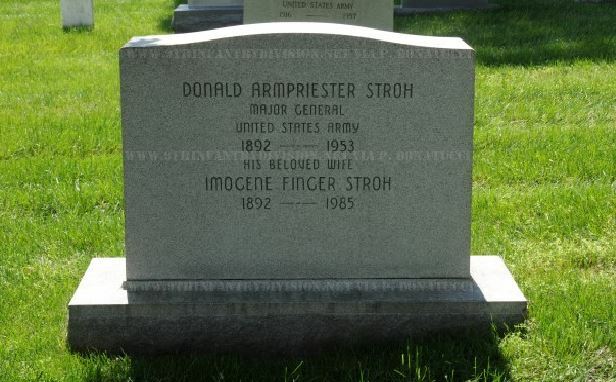 Major General Donald A. Stroh’s Grave at the Arlington Cemetery, Washington DC. In 1962, the Donald A. Stroh U. S. Army Reserve Center was dedicated in Detroit. General Stroh is survived by his daughter, Imogene Stroh Stumpf of Atlantic Beach, Florida, three grandchildren, and five great-grandchildren, and three great-great-grandchildren. While serving as a Brigadier General of the 9th Infantry Division in North-Africa in 1942, General Stroh picked up a transport container of a German Tellermine 42. He used it from then on to keep some of his personal belongings in. Grandson Harry Stumpf donated the tellermine case to the museum in 2017, and in March 2019 the it was added to the collection of the wonderful Hurtgen Forest Battle museum, the Museum “Hürtgenwald 1944 und im Frieden” in Vossenack, where it is now on display. The personal Tellermine case of Donald A. Stroh. Special thank you to Mr. Bob Stumpf who provided me the great details about General Stroh.